A Chinese container ship has become the first vessel to travel from the Atlantic to the Pacific Ocean via the expanded Panama Canal. The £3.8bn project, which has taken more than nine years to compete, has doubled the canal’s capacity. It is hoped that the improvements will make it easier for superyachts making the crossing. More than 30,000 people worked on the project and to coincide with its official opening EarthCam has revealed a time-lapse video of the works. The project was due to be completed by 2014 but strikes and disputes over the cost delayed the project. Panama hopes that the expansion will increase revenues and the country’s President was jubilant about its opening. "This is an achievement that all of us Panamanians should be proud of," President Juan Carlos Varela said at the inaugural ceremony on the outskirts of Panama City. "Today marks a historic moment for Panama, for our hemisphere and the world." "This new transit route is the tip of the iceberg in making Panama once again the logistics center of the Americas," canal administrator Jorge Luis Quijano added. "And it represents a significant opportunity for the countries of the region to improve their infrastructure, increase their exports." Authorities hope that the expansion will enable it to better compete with the Suez Canal. Last year the Suez Canal also completed expansion, which saw the addition of a new 35km channel alongside it. 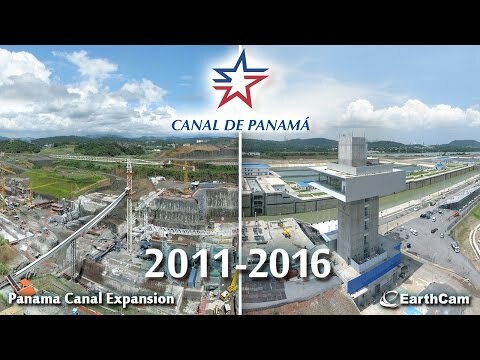 The Panama Canal will also face competition from a new passage being built by the Chinese in Nicaragua. Crossing the Panama canal can be included as part of private visit or luxury yacht charter in the San Blas islands.